Greg King of Mountain Brook knows the Birmingham Zoo is a great place to take business clients and other out-of-town guests for an educational and unique introduction to the area. But IberiaBank’s regional president of Alabama said he has an even more personal reason for supporting the Birmingham Zoo these days. King said he got involved with supporting the zoo after IberiaBank entered the Birmingham market in 2009. 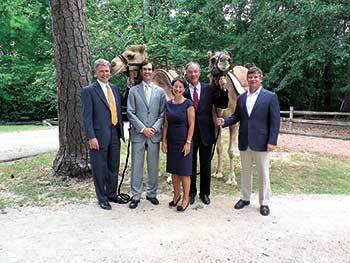 The bank sponsors fundraising events for the zoo, including the upcoming ZooGala Sept. 13. King is a graduate of Birmingham-Southern College, has a master’s degree in business administration from the University of Alabama at Birmingham and has previously worked for Highland Bank and AmSouth Bank in Birmingham. He served as IberiaBank’s Birmingham market president and in October was named the regional president of Alabama to oversee all of the Lafayette, La.-based bank’s operations in the state. King said the most compelling conversations he had when brainstorming ways the bank and the zoo could partner were with William R. Foster, the zoo’s president and chief executive officer. “After talking to Dr. Foster, I knew we wanted to do all we could to support the zoo and have a real relationship with them,” King said. That relationship has meant that the zoo has the resources to continue to offer Birmingham metro residents and visitors alike a unique opportunity, King said. King said the zoo has been a great community partner for the bank. “One fun example is when we opened a branch in Mountain Brook Village in 2011 and Dr. Foster arranged for us to have an actual llama at the branch opening,” King said. Those kinds of up-close adventures with animals is one of the reasons King said he thinks the zoo is also a great place for business-related events. “From the business perspective, we have the opportunity to offer our clients something different, an experience they won’t forget, and really show them the fun side of Birmingham,” King said. Guests at this year’s ZooGala will also have a chance for some cozy encounters with the zoo animals, King said. Throughout the evening, guests can look forward to animal walkabouts and special appearances by the zoo’s African bull elephants in the Trails of Africa. This year’s ZooGala will have a Moroccan souk theme. As guests wander through the tents decorated with colorful tapestries and hanging lateens, they can eat, drink and watch live entertainment. The 14 Karat Gold Dance Band will provide the musical backdrop for the evening, and the food will be by Kathy G & Company. From 9-11 p.m., guests can have drinks and desserts and dance as they “Boogie with the Beasts” at an after-party presented by the Birmingham Zoo Junior Board. The set-up for this year’s event is a bit more casual than in years past, King said–and that’s all by design. And that’s what King said he likes about the zoo most of all.